1. 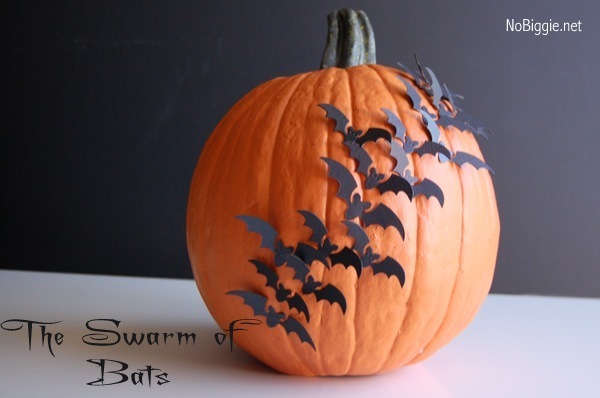 The swarm of Bats pumpkin: This one is perfect for paper crafters and for when you buy your pumpkins really early, and you’re just not ready to carve them yet. 3.The creepy eyeball pumpkin. This one is great with those awesome white pumpkins. 4. 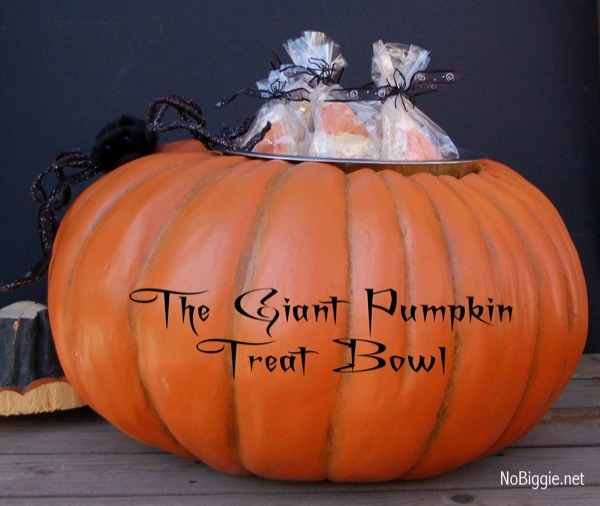 The giant pumpkin bowl – perfect for serving treats at a Halloween party. 5. 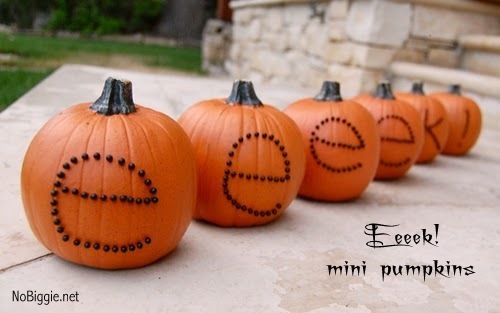 The mini “Eeeek!” pumpkins – again another no carve pumpkin idea. These are awesome Kami! I think the “eeeek” pumpkins are my favorite. So cute for a front porch, or along a window sill. Thanks for sharing. Don’t you just love pinterest!? Oh I love all of those Kami! Except the eye ball one freaked me out a little. 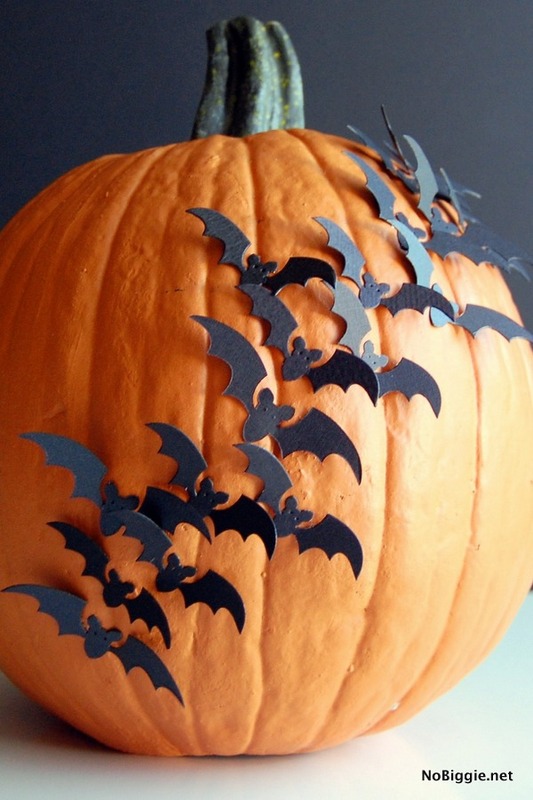 🙂 I want to try the paper bats – that is so adorable and fun! Thanks for the cute ideas! I saw the eeeeek! at your house, it was so cute. omg i love your site! I love halloween 🙂 will have to try these out. Great ideas!! Thanks for the inspiration!! I loved the first pumpkin. I think that is a great idea and looks so easy. you could poke anything in there with a toothpick. awesome! Great ideas. I love the swarm of bats. I have seen this done on walls, but never thought to put them on a pumpkin. Two thumbs up! Thanks for sharing. These are such great ideas! My favorite is the eeeeeek – so cute! I’d love for you to link up to my party if you have a moment. Thanks! I love the swarm of bats! another reason I should have bought that bat punch. I bought a fake pumpkin this year from Michaels because every year I battle the squirrels and lose 🙁 I have to decorate it still, I’m thinking bejeweled. Squirrels don’t like glittery things, right?! 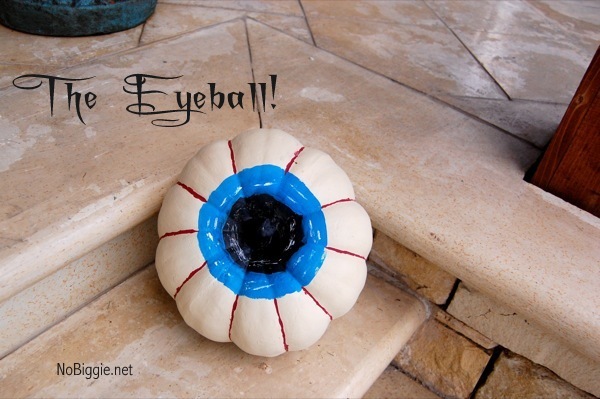 I love all of those ideas…the eyeball is very clever! What cute pumpkins. I love how the swarm of bats makes such a big impact with so little mess. No pumpkin goop or paint. Thanks for linking up!I featured your post on my wrap up! 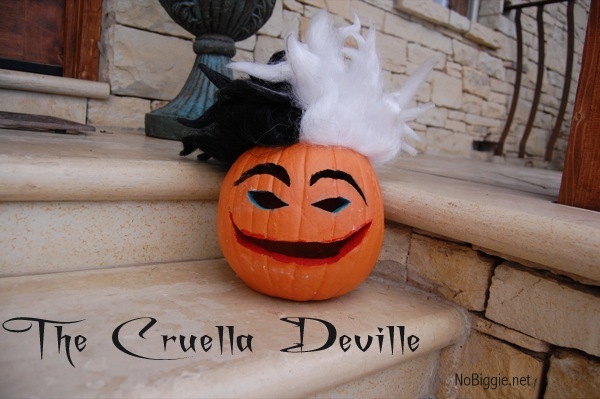 http://tidymom.net/2011/10-easy-halloween-crafts/ Have a great weekend! I love the eeek! Are those tacks in there or something else? Thanks! Where did you find the cute bat pattern !!!! LOVE THEM ALL !